Are you a regular computer user? Whether it’s for school, work, or play, you need the right accessories for your computing needs. One of the must-haves when it comes to computer accessories is the mouse. There are countless options available in the market when choosing a wireless mouse. You have to narrow down your options to find something that works well for you. In this new era of emerging technologies, wireless capabilities are one of the crucial aspects you might want to consider when choosing a wireless mouse for your computer. However, you still have to select one from the many wireless mouse available in the market. This following material serves as a guide on the best wireless mouse for 2018. It will make it easier for you to choose a wireless mouse for your computer. This mouse is regarded as one of the best options available. It’s a sublime wireless mouse that comes with excellent accuracy, exceptional comfort, and great features. It’s a class leader when it comes to overall performance. 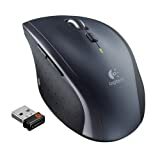 First, the mouse’s compatibility with the Logitech’s Flow Technology allows it to connect seamlessly with multiple devices. It also has dual connectivity, which means you can connect up to three computers via Bluetooth or through a unifying receiver. The adjustability of the Logitech MX Master 2S is 50 DPI (dots-per-inch) steps, which starts from 200 up to 4,000. With a price tag of around eighty, this mouse comes with a 500mAh rechargeable battery that’s designed to last up to 70 days. That’s way over two months, which means you don’t have to worry about your mouse running out of charge any time soon. But that’s not all. The battery has fast recharging too. You only need a few minutes to recharge it. What’s more, regardless of the grip style you prefer, holding this mouse will be very comfortable because of its ergonomics. 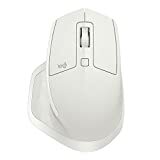 The mouse is also equipped with a gesture button, whose function is to allow you to set up custom actions that you need your digital features to perform. Overall, the performance of this mouse is solid, with excellent ergonomics, portability, and functionality. This is by far one of the best wireless mice you can find in the markets. It’s an inexpensive mouse that costs about only around thirty dollars. This mouse feels comfortable in the hand. Its sensor can track on almost every surface except glass. Connection to your computer is aided by a small wireless dongle that comes with the mouse when you buy it. The connection itself is fast as well as reliable, so you don’t have to worry about interference unless you or someone accidentally removes the dongle. This mouse also features eight programmable buttons. These buttons, together with an extra button, allow for both freewheel and ratcheted scrolling. The Logitech Marathon M705 has a great battery life, saving you the hassle of having to change your battery frequently. The battery can last up to three years. Keep in mind that this mouse does not have Bluetooth connectivity. This is an excellent alternative to the Marathon M705. It costs about forty dollars, and one of the major differences with the M705 is that the M720 comes with Bluetooth connectivity. This mouse can not only pair with but also switch quickly between devices. This feature makes it more versatile than its Marathon counterpart. The Logitech M720 Triathlon has a battery life of about two years. It comes with six programmable buttons. You can customize these buttons using the scroll wheel similar to M705 or via the right- and left-click buttons, which are swappable. Overall, this mouse is more versatile than the Marathon, but not as affordable or even as comfortable. 【Strong compatibility:】smooth, precise and affordable mobile Optical Mouse with Nano receiver for laptop, desktop and netbook PCs.Well compatible with Windows XP, Windows, Windows Vista, Mac OS X, Windows 2000 Server. 【Ergonomic hand-feeling:】slightly wider size and symmetric design make this USB mouse suit both of your hands, easier to control. Contoured shape and sweat-resistant surface provide extra comfort. 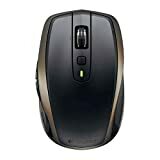 【Efficient transmission:】deliver a powerful, reliable 2.4GHz wireless mouse connection with high anti-interference performance with 32.8ft/10M transmission distance. A Mini USB receiver(stored in the battery slot) supports plug and play. Are you on a budget? This mouse is the ideal option for you. With a price of about ten dollars, the VicTsing PC104A is highly affordable. It comes with a small wireless dongle or USB, which means all you have to do is plug and play, and you are good to go. Three choices are available when it comes to the DPI: 1600, 1200, and 800. The USB receiver and the mouse itself can communicate up to a distance of 10 metres. Also, you have up to 12 months of battery, so you don’t have to worry. 5 ADJUSTABLE CPI & 2 POLLING RATE. 800,1200,1600,2000,2400, easily change the cursor sensitivity depending on your activity. 2 polling rate: 125Hz and 250Hz. Comes with a Nano receiver (stored in the back of the mouse). No need any driver, and you can plug and play the wireless mouse directly. STRONG DURABILITY & LONG WORKING DISTANC. Passed 5,000,000 times keystroke test to guarantee extra durability. 2.4GHz wireless technology and professional chip (PAW3212) ensure longer working distance, reaching up to 33ft. This mouse uses technology that focuses on maximizing the battery life. With just a single AA battery, you have up to about 15 months of battery life. The mouse has an auto switch off function, which helps maximize battery life. This feature switches off the mouse when you turn off your computer or disconnect the receiver. It’s also ideal for the budget-conscious because it costs just about ten dollars. This mouse has the ideal scroll speed with five adjustable CPIs. Its signal range is 50 feet, which is quite a long distance away from which you can operate your computer. The mouse feels comfortable in the hand even for long hours of use thanks to its contoured shape. The advantages of this mouse are that it moves well and is light, so you won’t feel like it’s bulky in your hands. It’s also affordable and quite easy to set up. However, a few things you may want to know about the downsides of this mouse is that it does not have a silent click, and the back and forward buttons are on the left so it might take a while before you get used to it. If comfort is your primary focus, this is the mouse for you. It has a sculpted shape that helps keep your hand in one place, providing ample support during use. 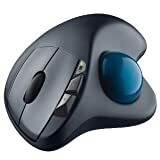 The precision trackball of this mouse has a sensor that does not only allow you smooth and precise control of the cursor with your thumb but also carries all the workload weight. It has an excellent battery life that will last up to 18 months. 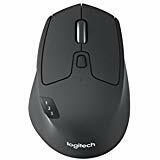 The 2.4 wireless connection of the Logitech M570 works on both Mac and Windows operating systems and can extend up to a maximum of 30 feet. The unique trackball design of this mouse enhances its comfort when it’s in use. Priced at about twenty five dollars, this is undoubtedly one of the best wireless mice to consider for your computing needs. Perhaps one of the drawbacks of this mouse is that the scroll wheel can feel rough and is quite cheap. What’s more, the ball may fall out too easily too, so keep that in mind. Portability is vital when buying computer accessories. If you are looking for a wireless mouse that’s highly portable, the Logitech M510 is an excellent place to start. It’s equipped with a powerful USB receiver that can connect up to six devices. It also has a remarkable battery life that can keep its charge for up to two years. One of the features that make this mouse ideal in terms of portability is its onboard laser that can work on almost every surface, making it easier to use when you don’t have your mouse pad. When it comes to ergonomics, this mouse is well-designed. It has rubber grips on the sides for proper grasp. However, on the left side of the mouse, are two buttons that can limit its use to right-handed people only. 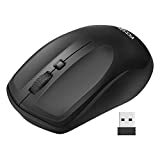 You can customize all the buttons on this mouse to perform a range of functions, including opening or minimizing windows, jumping to full screen, and switching applications. This mouse is priced at around sixty dollars. It is a versatile option that comes with a range of features you will find rather useful. It has a 1600 DPI with Bluetooth connectivity as well as 2.4GHZ wireless technology. You can pair this mouse with up to 3 devices. Set up is easy whether you decide to use Bluetooth or the wireless technology. The Logitech MX Anywhere Two is also equipped with other features, including a scrolling wheel, a unifying receiver, gesture function, and Logitech’s darkfield laser tracking. It comes with a non-removable battery that’s long-lasting. The battery also supports quick charging, and within just about 4 minutes, the mouse will have enough charge for the entire day. Compared to the MX Master, Logitech’s flagship, the MX Anywhere 2 is more compact and portable. Are you the avid gamer? Then this could be the mouse for you. While many people argue that wired mice are better for gaming because of better reliability and latency, this mouse would make them have a change of opinion. This Logitech flagship is designed with a high-accuracy sensor. It also features wireless charging and allows for customization of both the software and the hardware components. The Logitech G903 can deliver up to 12,000 DPI. Its highly sensitive and accurate optical sensor is referred to as the Pixart PMW3366. The sensor has numerous features that make it ideal for gaming. They include zero smoothing, acceleration and filtering, and surface tuning support. The mouse weighs about 110 g. The wireless charging is aided by the mouse’s Power Core system that doubles as a wireless receiver too. The shelf life is rated at the upwards of about 50 million clicks. 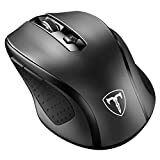 While this mouse has unique features that make it an excellent mouse for gaming, you should be prepared to spend quite a lot of money buying it. That’s because it is priced at about a hundred, which may be quite a lot for some people. Keep that in mind before you buy this mouse. If you want a way cheaper alternative to the G903 Lightspeed, this would be an ideal choice to consider. It costs about forty, and one of its key features is its long battery life. You will enjoy about 250 hours of battery life with this mouse. The shelf life is rated at above 20 million clicks. Logitech uses a sensor technology known as Delta Zero for this mouse. This technology has a high response rate of two milliseconds per click. The mouse is designed with a durable build to withstand a range of gaming experiences, including intense gaming. What’s more, the mouse has 11 programmable buttons and can support both Mac and Windows operating systems. All these features make the Logitech G602 mouse a highly competitive option if you are looking for a gaming mouse. If you are an Apple fanatic who fancies everything the company churns out, this is the mouse you need. It costs about eighty. Since Apple always thinks different, this mouse is dissimilar from all the mice mentioned above on a range of aspects. For instance, Apple skips on the scroll wheels and buttons typical of most computer mice in the markets. Instead, Apple designs the Magic Mouse 2 with a multi-touch surface. A simple brush of a finger on the surface of the mouse is all you need to scroll through documents or swipe between Web pages. The base of the mouse has a foot design that ensures minimal desk or surface resistance when using the mouse. It has a built-in battery that will last about a month. The mouse comes with a Lightning-to-USB cable for charging the battery. It takes about nine hours to recharge the battery fully. It connects via Bluetooth and has a 1300 DPI. The multi-touch no-button feature of this mouse is perhaps the reason why it’s quite expensive. The Logitech M330 SilentPlus reduces the sounds made by most mice up to an exceptional 90%. 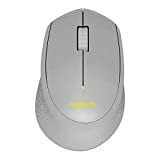 While you will experience the same click feel as most mice, you won’t hear the click sound itself when operating your mouse. It costs about ten to twenty dollars, depending on where you are buying it. It has a 1000 DPI with wireless connectivity of 2.4 GHz that works over a 10-meter range. It’s also compact with a battery life of about 24 months. However, this mouse is right-handed. What’s more, it doesn’t support Bluetooth connectivity. Make sure to keep its accompanying USB dongle safe. Ultimately, the best wireless mouse is the one that best matches your specific requirements and budget. You should be able to find something that suits you from the items listed in this review.